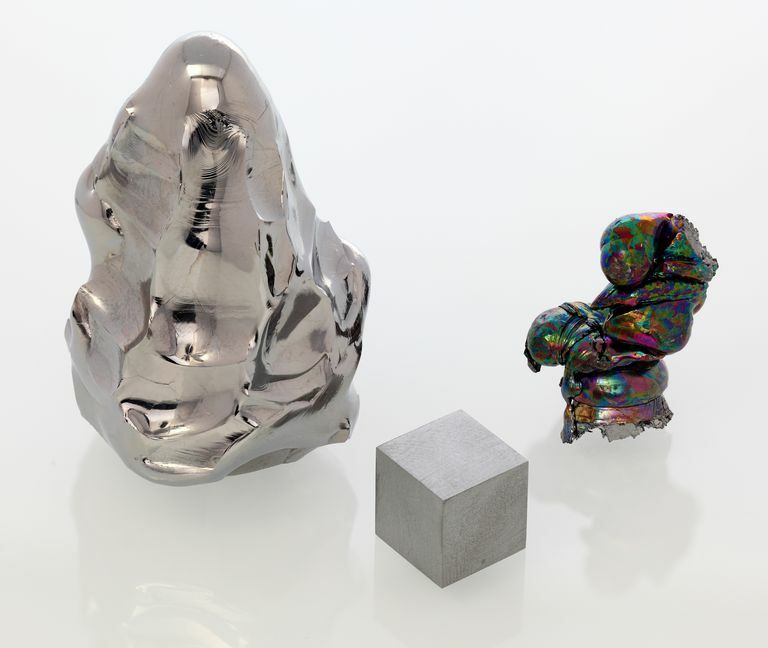 Fresh, pure hafnium is a metal with a bright, silvery luster. However, hafnium oxidizes to form a beautiful rainbow colored surface effect. Mendeleev predicted the existence of hafnium in a report he prepared in 1869. It was one of two non-radioactive elements believed to exist, but not verified. It was finally discovered in 1923 by Georg von Hevesy and Dirk Coster by using x-ray spectroscopy on a zirconium ore sample. The element name honors the city of its discovery (Hafnia is the old name for Copenhagen). As you might expect, hafnium is not found free in nature. Instead, it forms compounds and alloys. Because the two metals share similar occurrence and properties, hafnium is extremely difficult to separate from zirconium. Most hafnium metal has some degree of zirconium contamination. Although hafnium is found with ores (mainly zircon and baddeleyite), it is not as reactive as most transition metals. When hafnium is powdered, the increased surface area improves its reactivity. Powdered hafnium readily ignites and may explode. Hafnium finds use as an alloying agent for iron, titanium, niobium, and tantalum. It is found in integrated circuits, vacuum tubes, and incandescent lamps. Hafnium is used in nuclear reactors, mainly as nuclear control rods because hafnium is an exceptionally powerful neutron absorber. This is one significant difference between hafnium and its sister element zirconium -- zirconium is essentially transparent to neutrons. Hafnium in its pure form is not particularly toxic, but it does represent a health hazard, particularly if inhaled. Hafnium compounds should be handled with care, as should any transition metal compound, because the ionic forms be dangerous. Only limited testing has been done on the effect of hafnium compounds in animals. All that is really known is that hafnium usually exhibits a valence of 4. Hafnium is found in the gemstones zircon and garnet. Hafnium in garnet may be used as a geochronometer, which means it can be used to date metamorphic geological events. Greenwood, Norman N.; Earnshaw, Alan (1997). Chemistry of the Elements (2nd ed.). Butterworth-Heinemann. pp. 971–975. ISBN 0-08-037941-9. Schemel, J. H. (1977). ASTM Manual on Zirconium and Hafnium. ASTM International. pp. 1–5. ISBN 978-0-8031-0505-8.